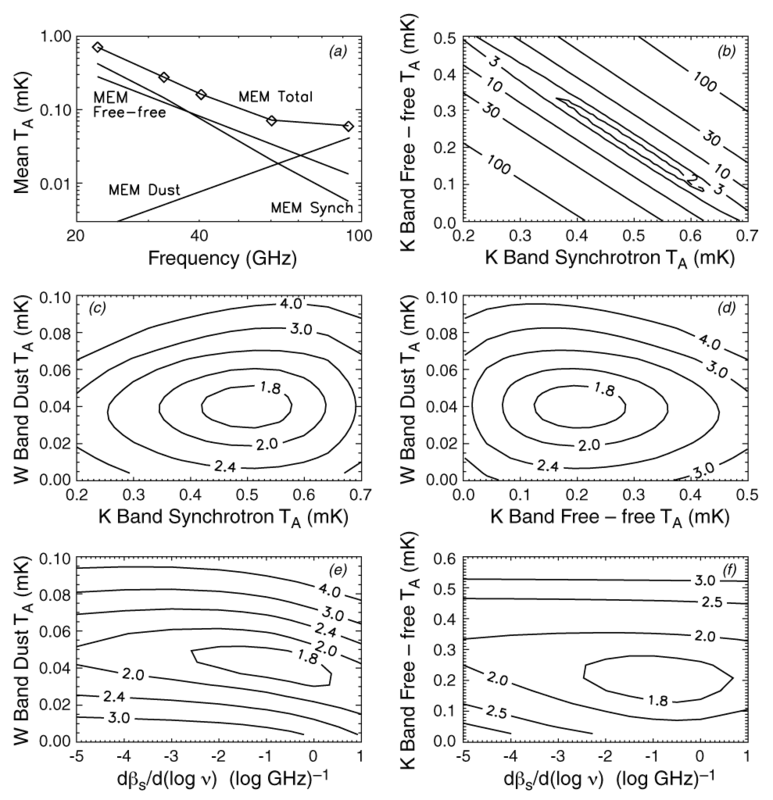 WMAP Three-year Paper Figures, Hinshaw et al. 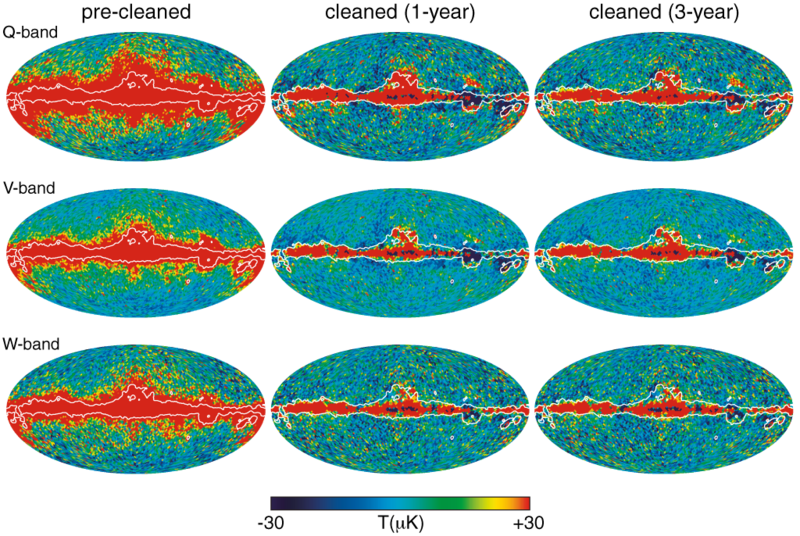 Full-sky maps in Galactic coordinates smoothed with a 0.2°; Gaussian beam, shown in Mollweide projection. 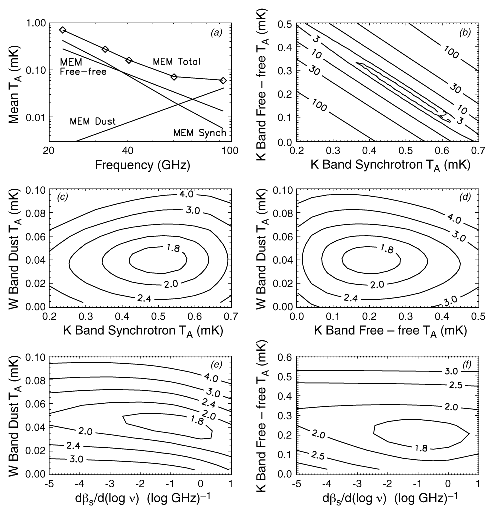 top K-band (23 GHz), middle Ka-band (33 GHz), bottom Q-band (41 GHz). 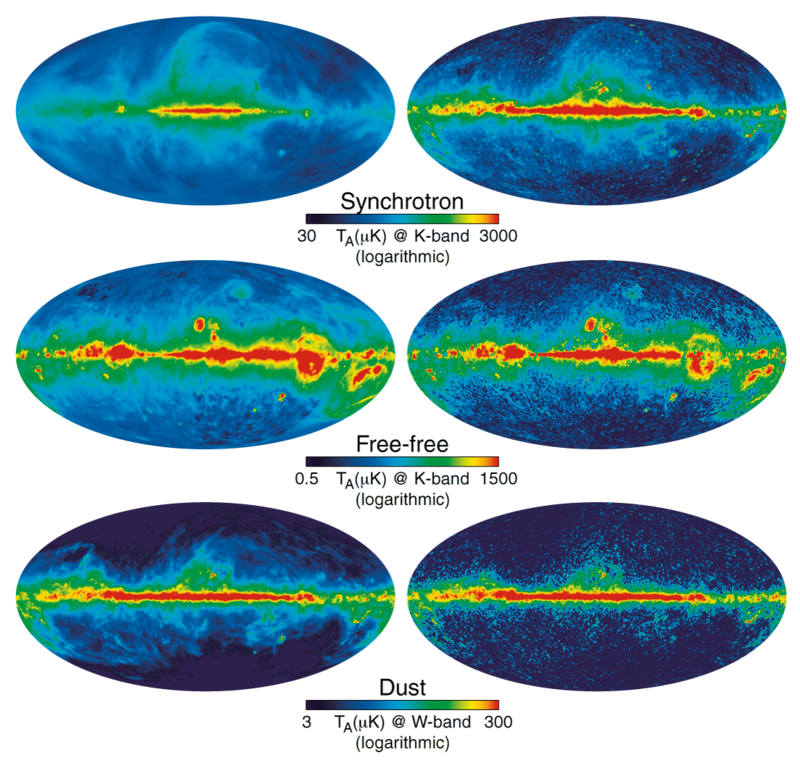 Full-sky maps in Galactic coordinates smoothed with a 0.2° Gaussian beam, shown in Mollweide projection. 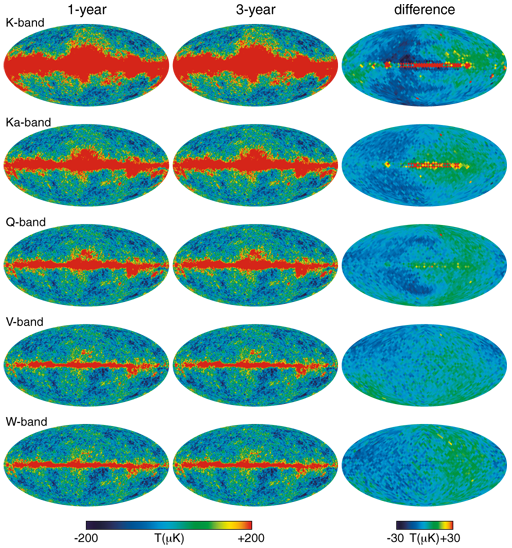 top V-band (61 GHz), bottom W-band (94 GHz). The number of independent W-band observations per pixel in Galactic coordinates, top: year-1, middle: year-2, and bottom: year-3. 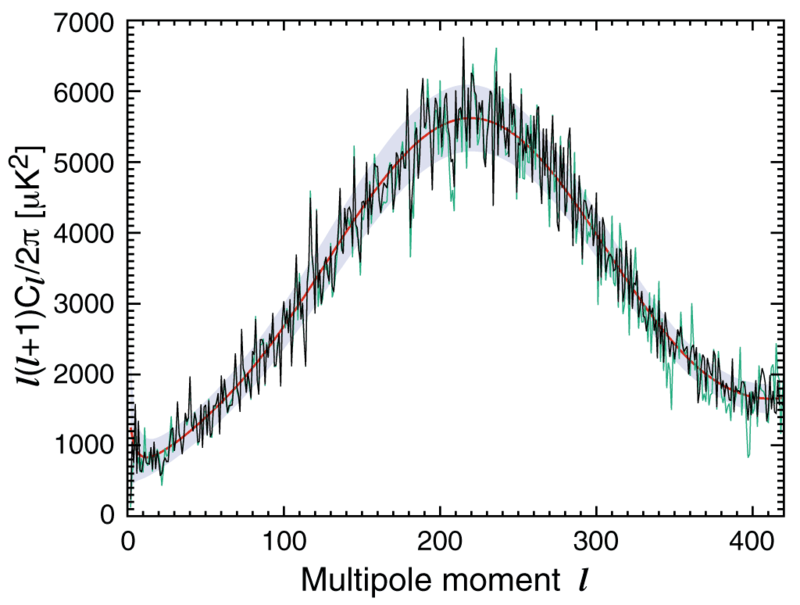 The number of observations is greatest near the ecliptic poles and in rings approximately 141° from each pole. Comparison of the three-year maps with the previously released one-year maps. 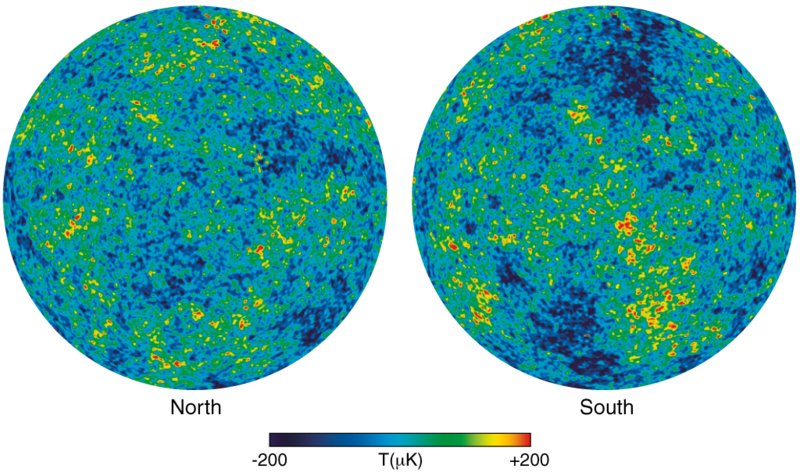 The data are smoothed to 1° resolution and are shown in Galactic coordinates. The frequency bands K through W are shown top to bottom. Results from the MEM foreground degeneracy analysis. 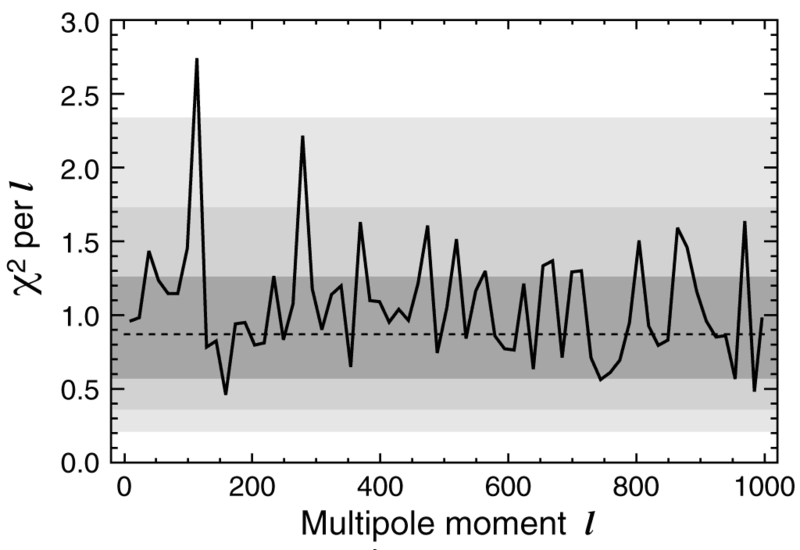 (a) The spectrum of total foreground emission (diamonds) compared to the sum of the MEM components (lines connecting the diamonds), averaged over the full sky. 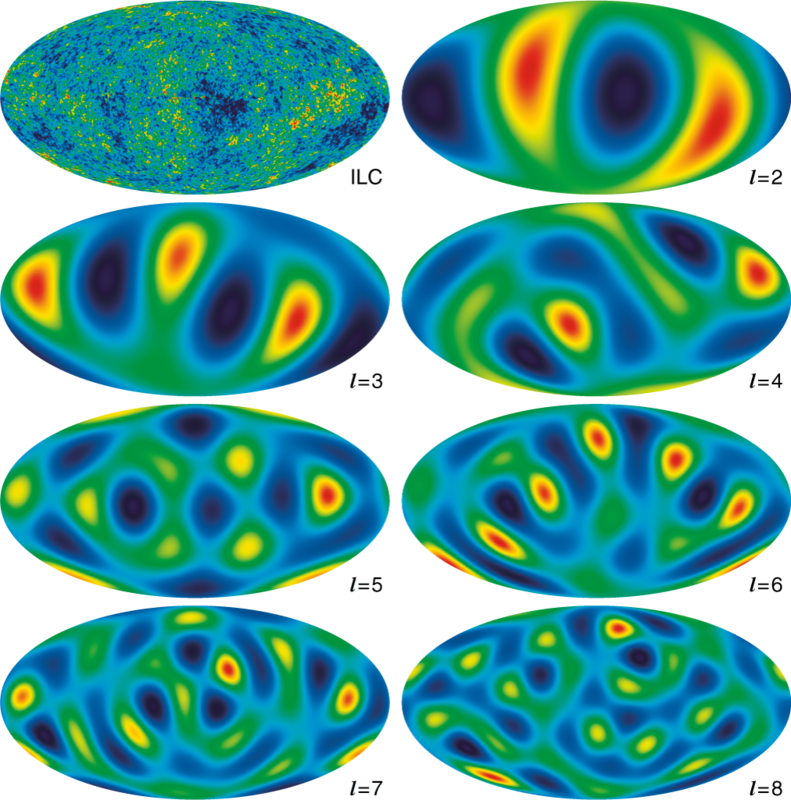 Galactic signal component maps from the Maximum Entropy Method (MEM) analysis (§4.5). 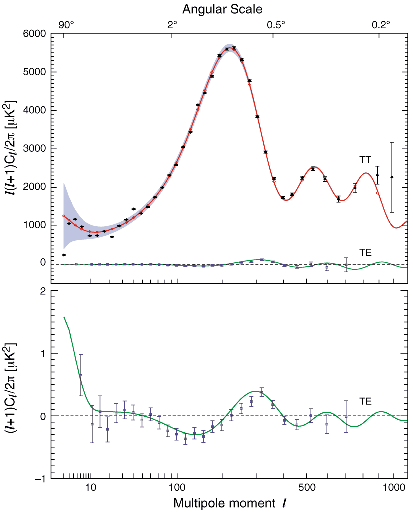 top-bottom: synchrotron, free-free, and dust emission with logarithmic temperature scales, as indicated. 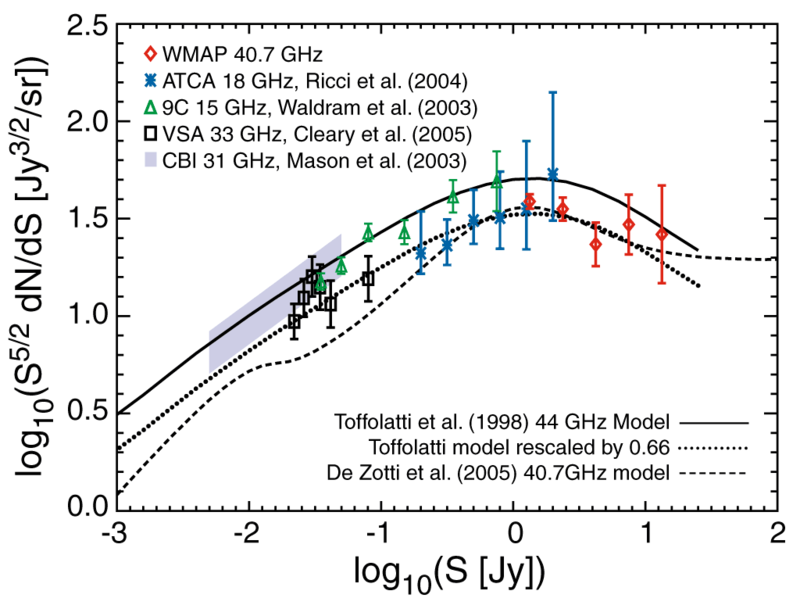 The mean Galaxy spectrum from 408 MHz to 94 GHz, based on data from Haslam, Tenerife and WMAP. 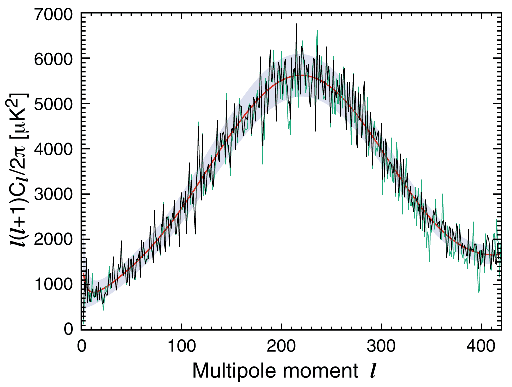 Each point is the mean signal in the Galactic latitude range 20°< |b| < 50° with the mean at the Galactic poles subtracted. 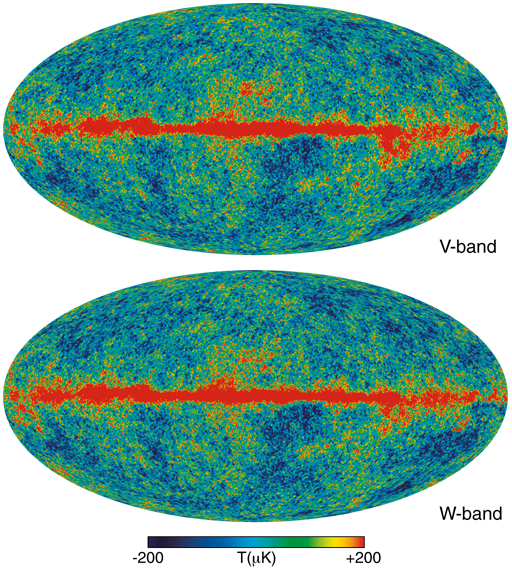 An overview of the microwave sky. 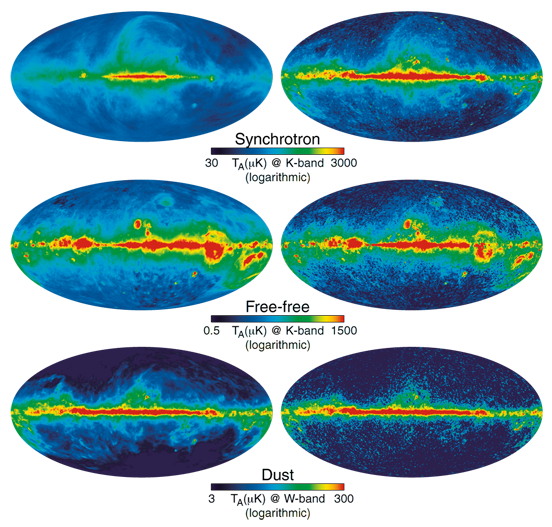 The yellow, salmon, and red shaded regions indicate the Kp0, Kp2, and Kp8 diffuse emission masks where the Galactic foreground signal is especially strong. 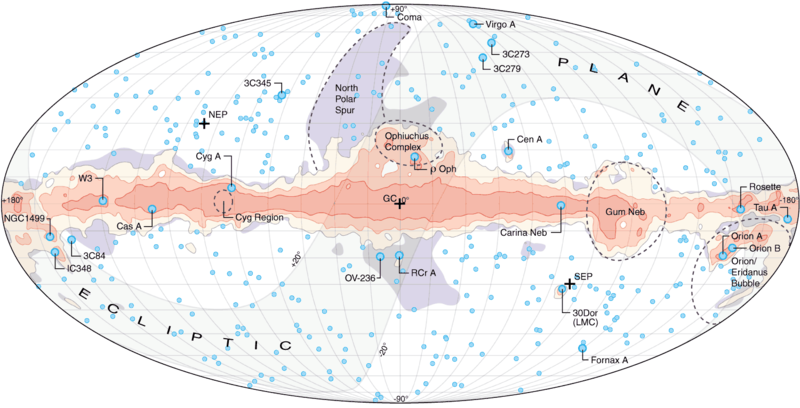 top: Full-sky map color-coded to show the 12 regions that were used to generate the three-year ILC map (see §5.2). 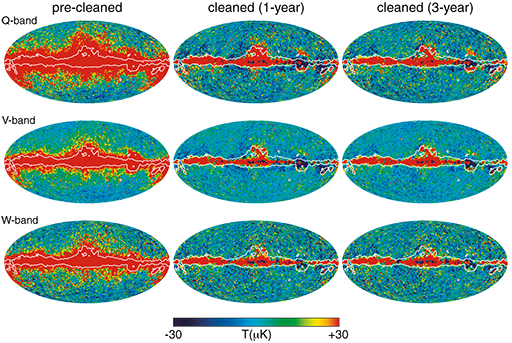 bottom: The mean ILC residual map from 100 Monte Carlo simulations of CMB signal, Galactic foreground signal and instrument noise. Galactic foreground removal with spatial templates. 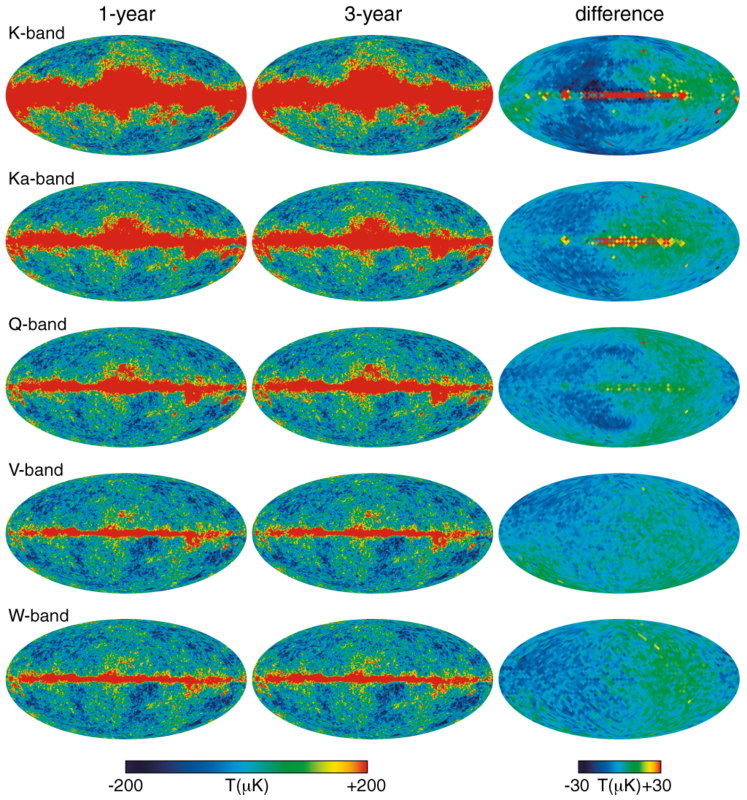 All maps in this figure are three-year maps that have had the ILC estimate of the CMB signal subtracted off to highlight the foreground emission. Measurement of the source number count distribution dN/dS. 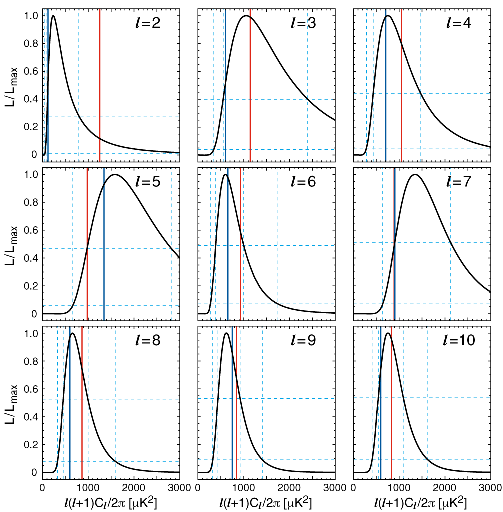 The predicted Cl uncertainty (inverse Fisher matrix) at low l, in μK4. 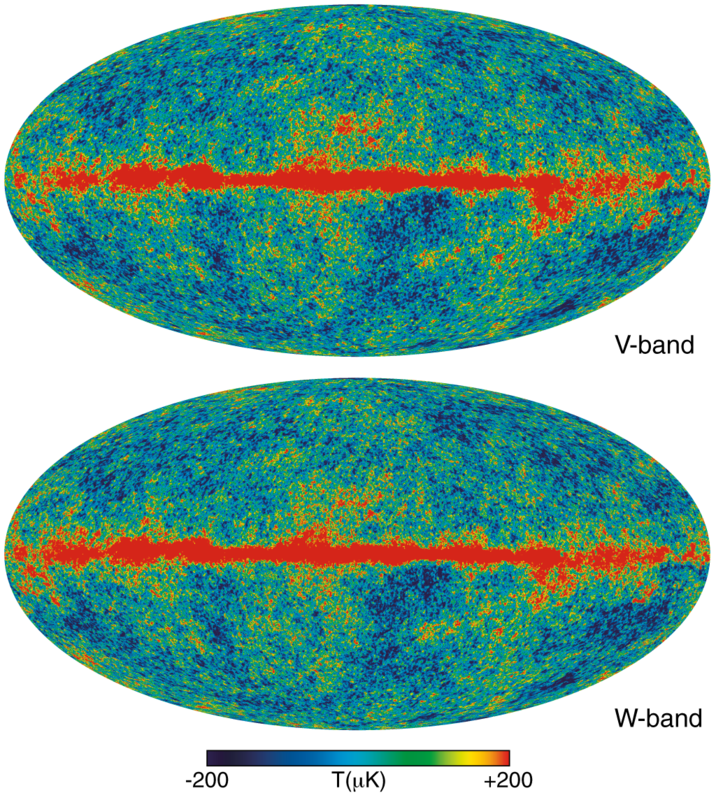 The red curves show the result when pixel-pixel noise correlations are ignored. 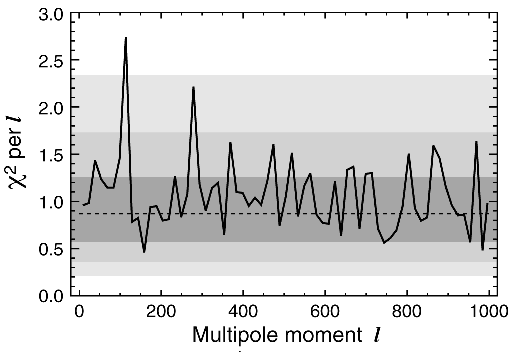 The smooth rise at low l reflects our approximate representation of 1/f noise in the noise bias model. 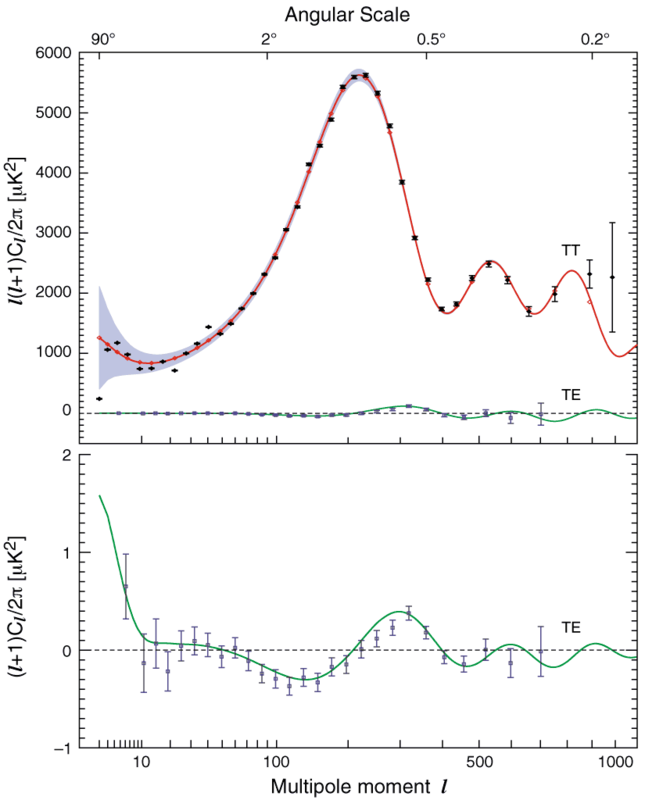 (top) Q-, V-, & W-band cross-power spectra before foreground subtraction, evaluated outside the Kp2 sky cut, relative to the final combined spectrum. 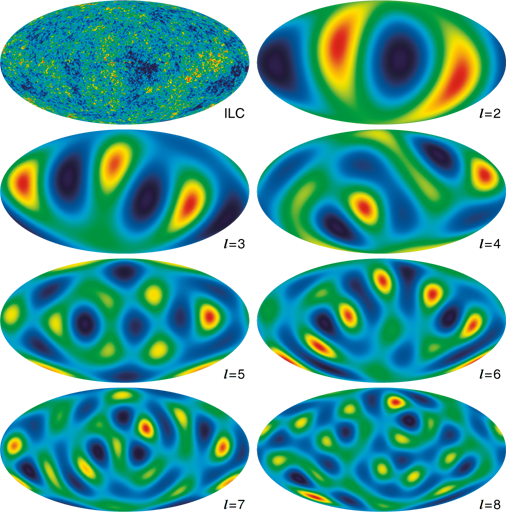 (bottom) Same cross-power spectra after subtracting a template-based diffuse foreground model (§5.3) and the best-fit residual point source contamination (§7.2). 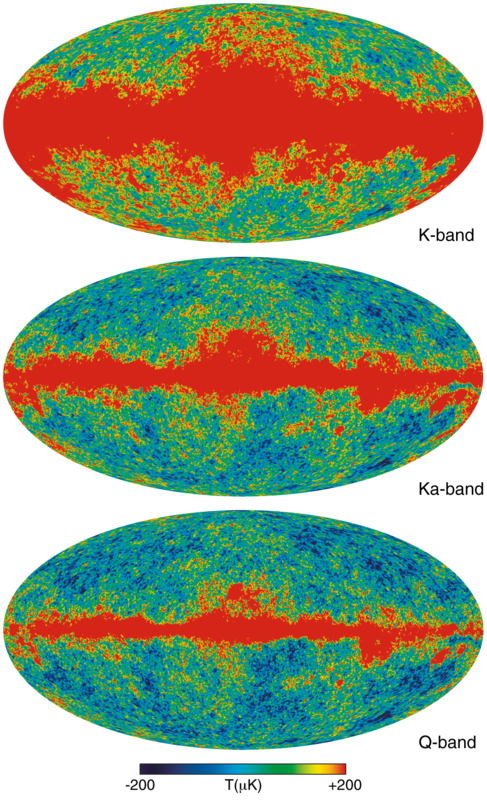 Maps of power spectrum modes l = 2 - 8 computed from full-sky fits to the ILC map, shown at top left. 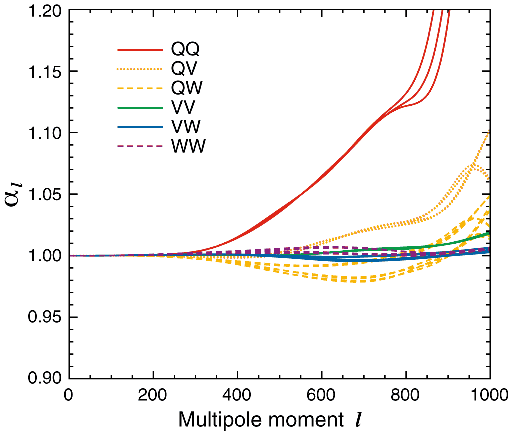 Many authors note peculiar patterns in the phase of these modes, and many claim that the behavior is inconsistent with Gaussian random-phase fluctuations, as predicted by inflation. 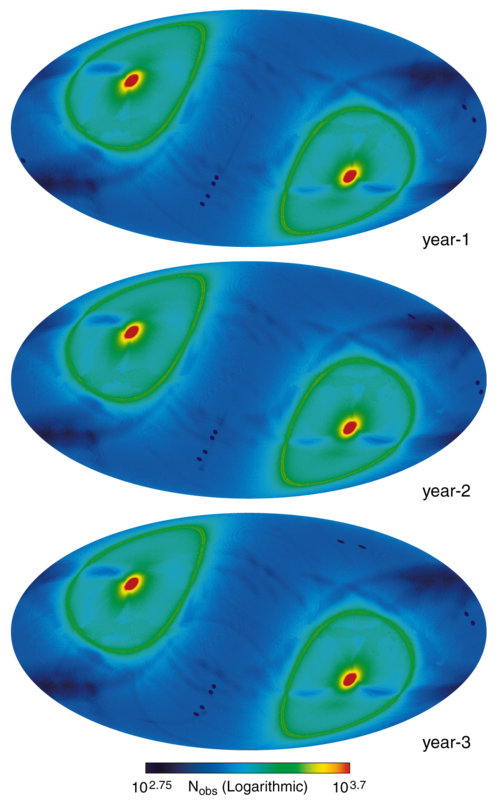 The posterior likelihood of l(l + 1)Cl/2π given the WMAP data, for l=2-10. 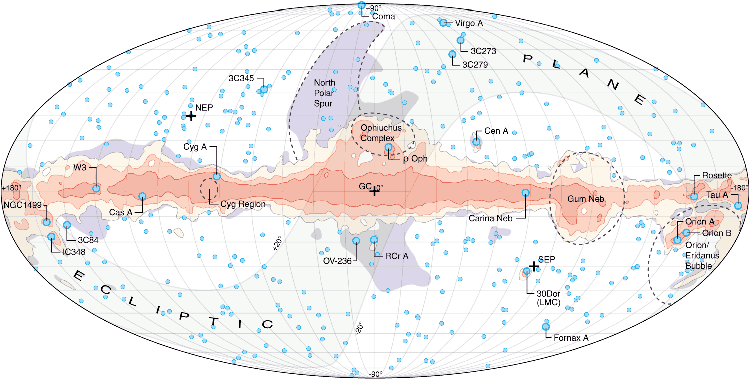 The curves are computed using data from the ILC map evaluated outside the Kp2 sky cut. 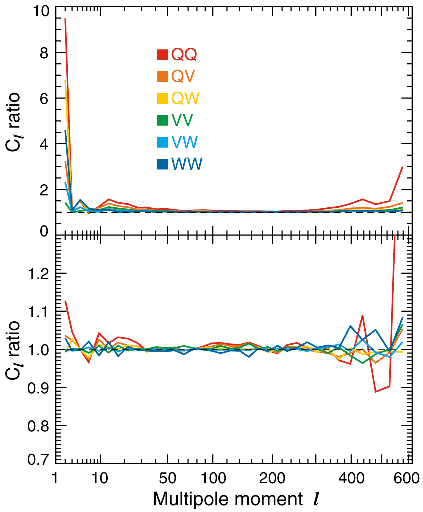 The vertical blue lines show the values inferred using the pseudo-Cl estimate. 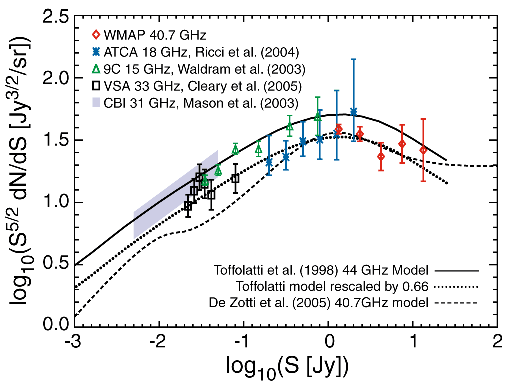 The binned three-year angular power spectrum (in black) from l=2-1000, where it provides a cosmic variance limited measurement of the first acoustic peak, a robust measurement of the second peak, and clear evidence for rise to the third peak. 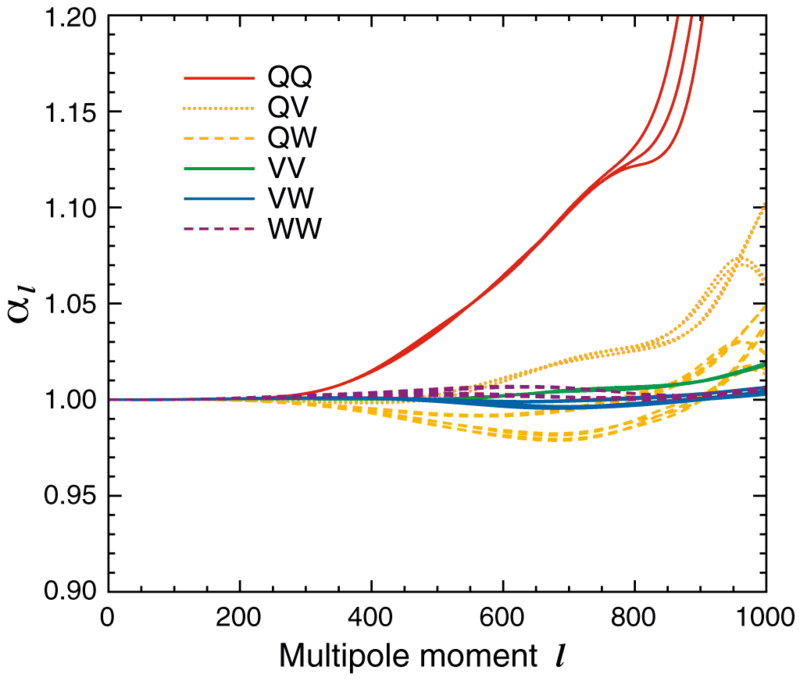 X² vs. l for the full power spectrum relative to the best-fit ΛCDM model, fit to WMAP data only. The X² per l has been averaged in l-bands of width Δl = 15. 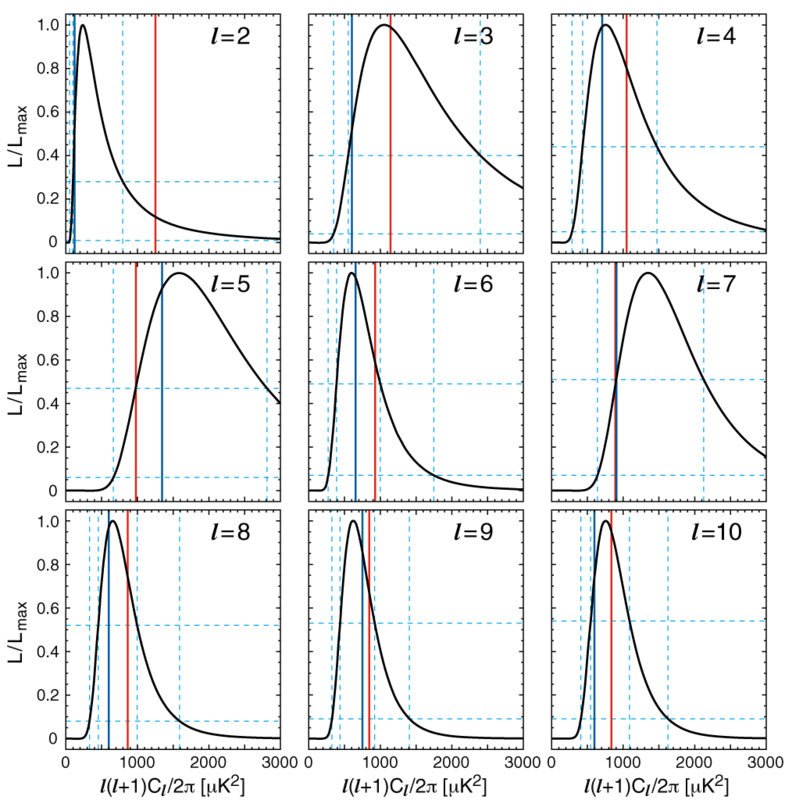 The dark to light grey shading indicates the 1, 2, and 3σ confidence intervals for this distribution. 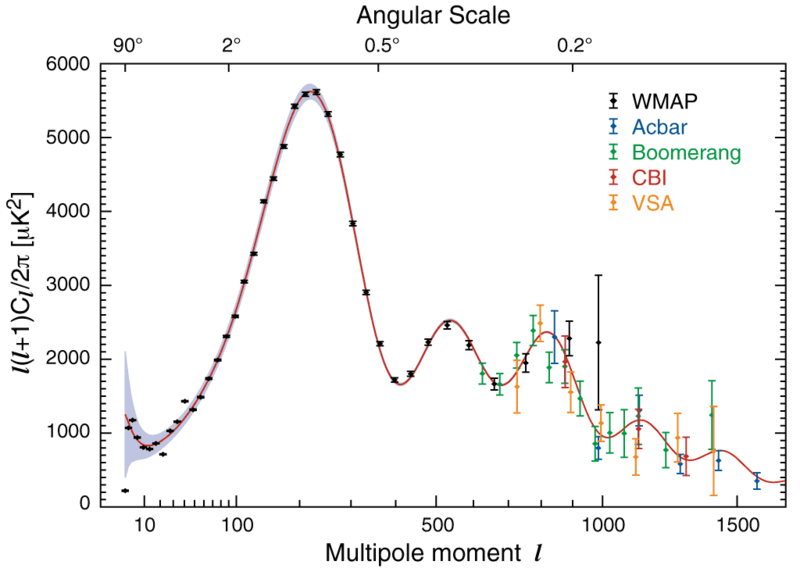 The WMAP three-year power spectrum (in black) compared to other recent measurements of the CMB angular power spectrum, including Boomerang (Jones et al. 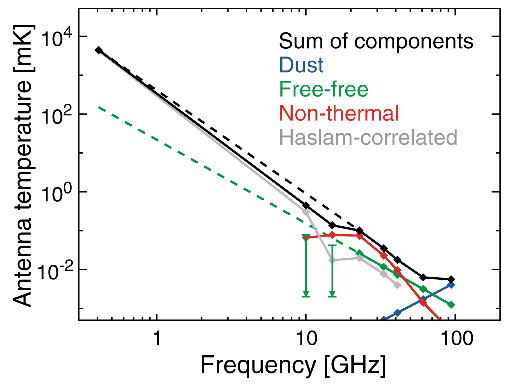 2005), Acbar (Kuo et al. 2004), CBI (Readhead et al. 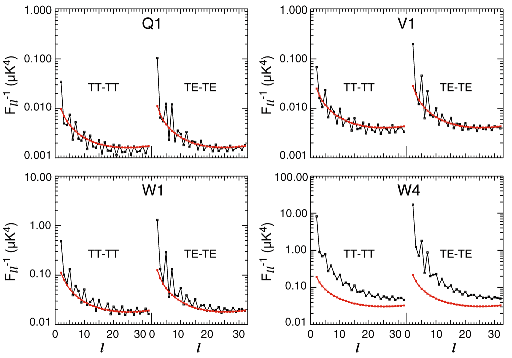 2004), and VSA (Dickinson et al. 2004). 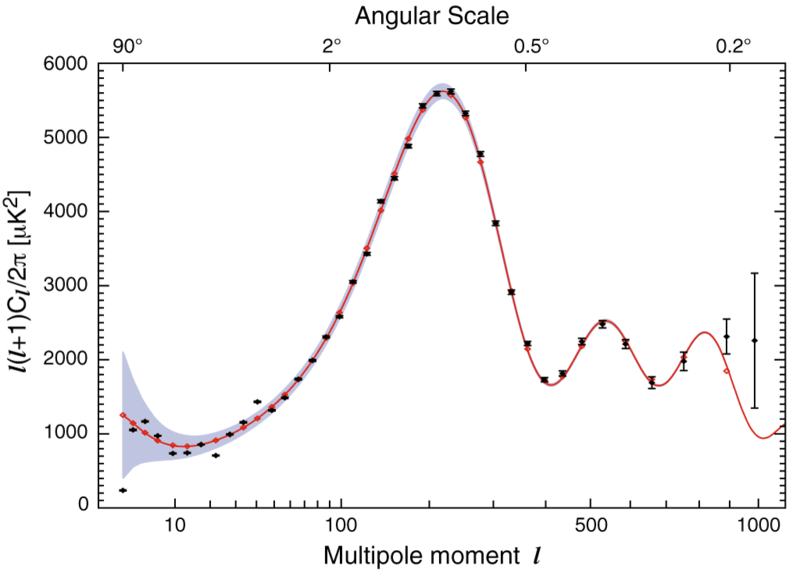 Comparison of the three-year angular power spectrum with the first-year result. 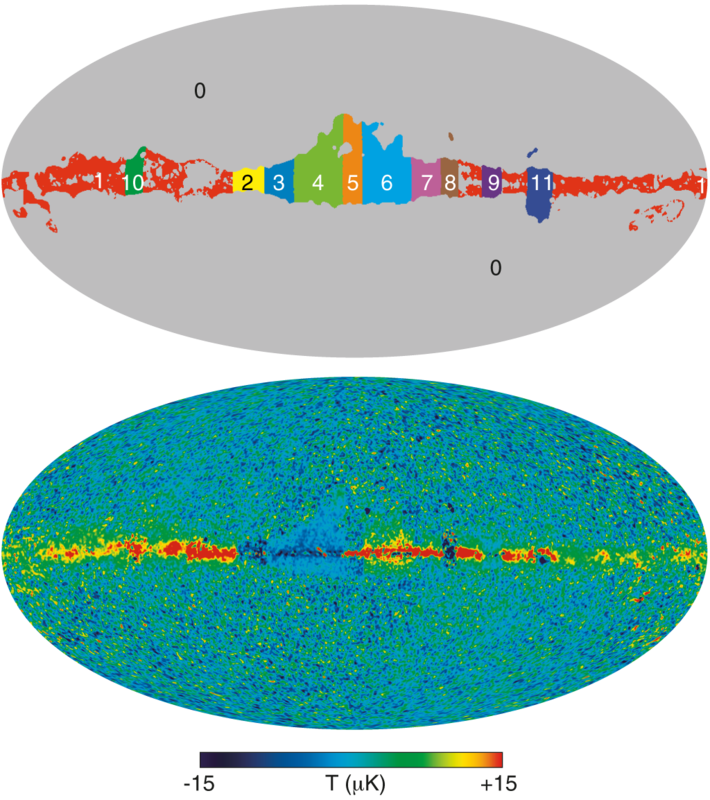 (top) The three-year combined spectrum, in black, is shown with the first-year spectrum, as published, in red. 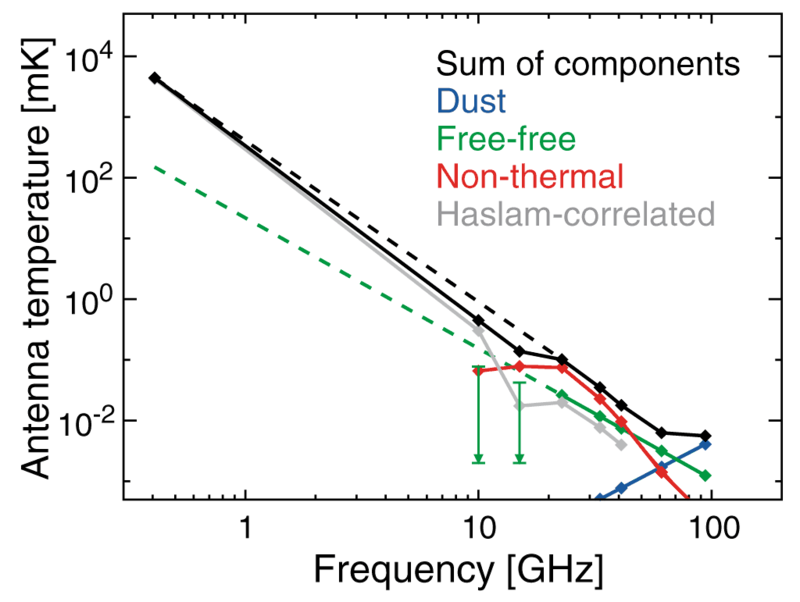 The best-fit three-year ΛCDM model is shown in grey for comparison. 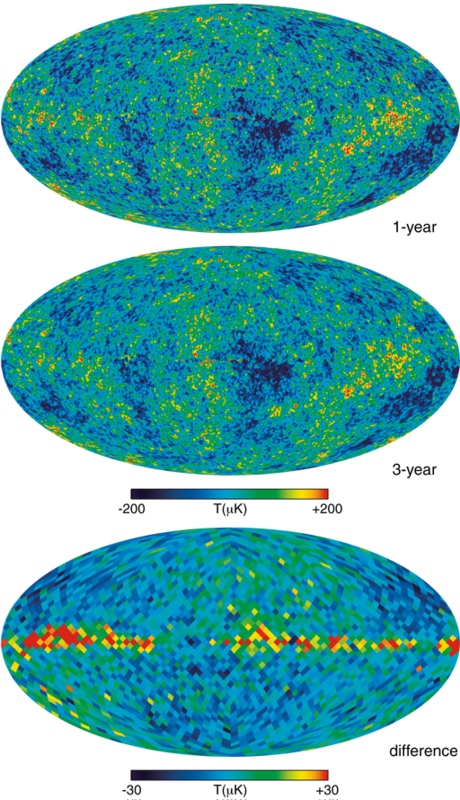 The unbinned three-year angular power spectrum (in black) from l=2-400, where it provides a cosmic variance limited measurement of the first acoustic peak. 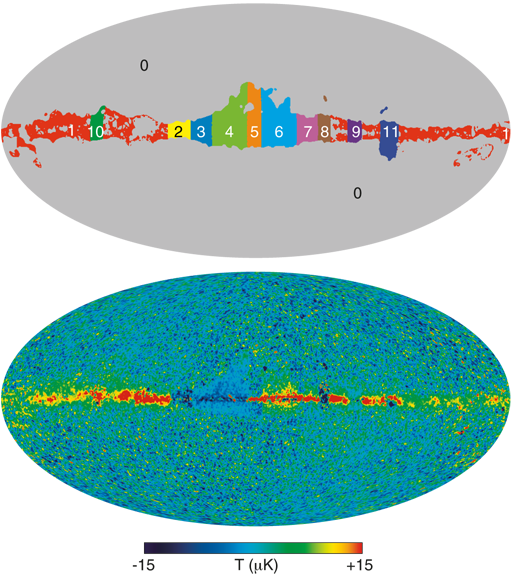 The first-year spectrum is shown in green for comparison. 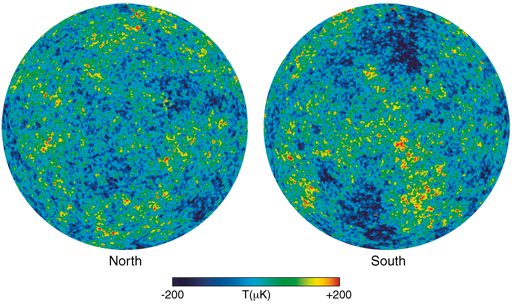 Full-sky ILC map in ecliptic coordinates smoothed to 1° resolution, shown in Lambert Azimuthal Equal Area projection. 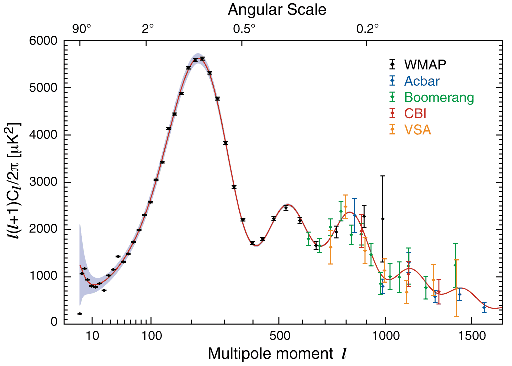 Angular power spectra ClTT & ClTE from the three-year WMAP data. 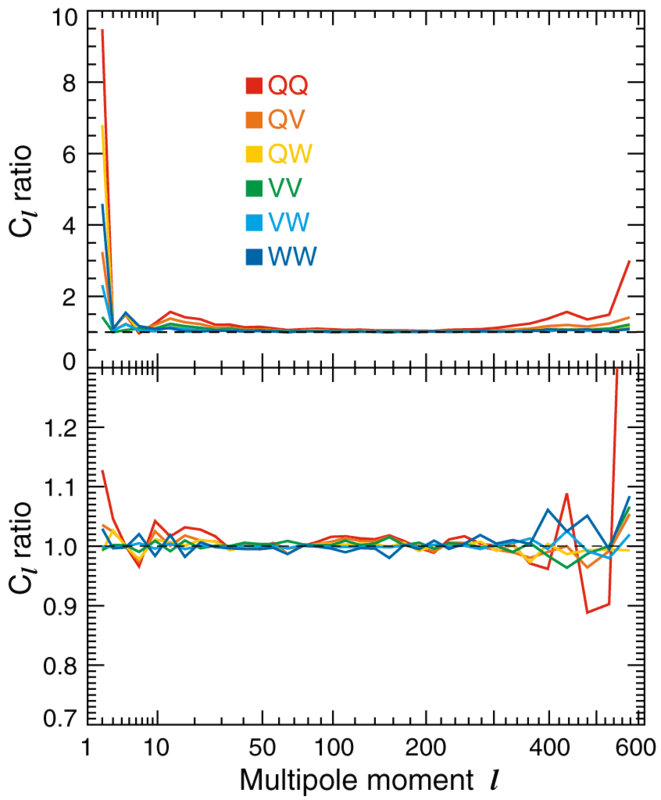 top: The TT data are as shown in Figure 16. 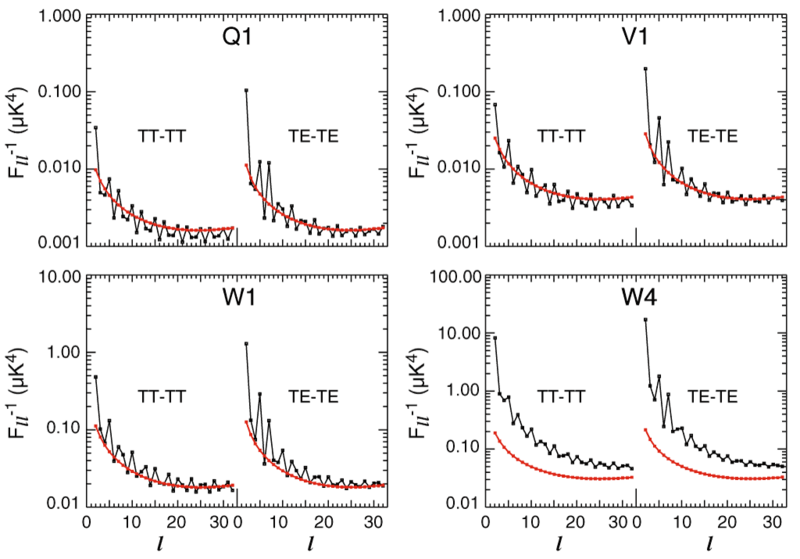 The TE data are shown in units of l(l+1)Cl/2π, on the same scale as the TT signal for comparison. bottom: The TE data, in units of (l + 1)Cl/2π. 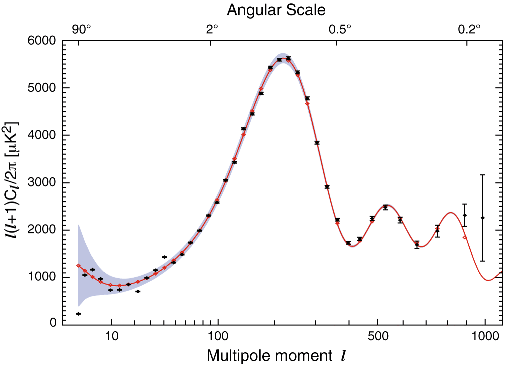 An estimate of the multiplicative error introduced in the angular power spectrum, Cl, due to the effects of beam asymmetry. See §7.1.1 and Appendix B for details on how this estimate was obtained.